As federal employees wait to see whether they will receive a pay raise next year, Republicans and Democrats both appear to be standing firm on proposals they want attached to a spending package needed to avert a partial government shutdown early next month. Since February, the Trump administration has called for a pay freeze for all federal civilian employees in 2019, a plan the president cemented in August with the release of his 2019 alternative pay plan. Congress has begun to take steps to override Trump’s proposal—the Senate approved an appropriations bill that would include a 1.9 percent across-the-board raise for civilian federal workers, and last month House negotiators suggested they would not fight against its inclusion in a final deal—but unrelated issues could jeopardize the provision, at least temporarily. Lawmakers and Trump have until Dec. 7 to come to an agreement on a spending package that includes appropriations for the Transportation, Housing and Urban Development, State, Interior, Agriculture, Treasury, Commerce, Homeland Security and Justice departments, among other agencies, or about 300,000 federal employees will face furloughs in a partial government shutdown. Trump has continued to insist on increased spending to build a wall along the U.S.-Mexico border, and on Saturday he suggested he might table any spending deal that does not meet that demand. “We’re talking about quite a big sum of money, about $5 billion. And I think, probably, if I were ever going to do a shutdown over border security—when you look at the caravan, when you look at the mess, when you look at the people coming in—this would be a very good time to do a shutdown,” Trump said. But Democrats too hope to get some of their priorities into the spending bill before the Dec. 7 deadline. 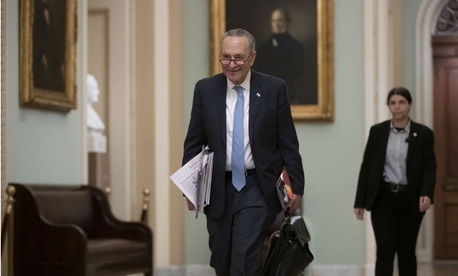 Last week, Senate Minority Leader Chuck Schumer suggested that a bipartisan bill designed to protect Special Counsel Robert Mueller from being fired could be attached to the package. On Sunday, Sen. Jeff Merkley, D-Ore., told MSNBC that he would consider voting against the appropriations measure if it does not include the special counsel measure. Merkley stopped short of explicitly calling for a shutdown if Senate Majority Leader Mitch McConnell continued to block the Mueller protection bill from reaching the floor, although he hinted at how he might vote on such a bill. Congress is out of town this week for the Thanksgiving holiday, leaving two weeks—and only eight legislative days—to work out a budget deal. Even if Congress doesn't include a pay raise at the end of the day, Trump is still required to finalize his plan for civilian employee compensation with a formal announcement before the end of the year.